Nothing gets the blood pumping on a long road trip quite like a good rock ‘n roll playlist. In a Blaze of Glory we go cruising down the highway with a killer line-up of rock anthems that will get your fists pumping. 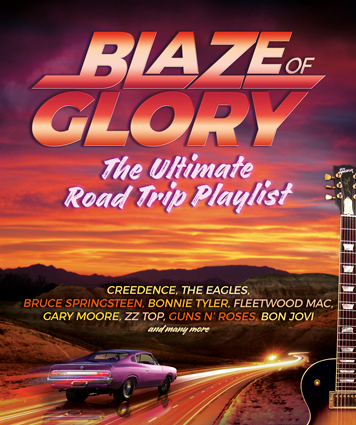 Blaze of Glory features a hot 8-piece rocking cast performing songs perfect for the open road. Experience a number of great tracks from the 1960s through to the 1990s; classic rock songs that have stood the test of time! The show pays tribute to rock icons, including Bon Jovi, Creedence Clearwater Revival, The Doobie Brothers and West Coast rockers - The Eagles and Fleetwood Mac. Also featured are 80s rock bands: ZZ Top, Heart, and Gary Moore. Experience some crazy road trip playlists that include everything from Greased Lightning, Little Deuce Coup, No Particular Place To Go and Get Outta My Dreams, Get into My Car. Further down the highway we turn up the volume to ultimate rock classics such as La Grange, Hotel California, Livin’ On A Prayer, You Give Love A Bad Name and many more. Get ready to rock as Blaze of Glory takes you on a cruise of footstompin’ music that will make this journey the greatest rock ‘n roll experience of all time!